On June 28th, the California Art Club hosted a professional critique offered to members of the Club and I’m proud to say that I jumped at the chance. They accepted the first 40 painting or paintings of sculptures that they received that fit the digital requirments. The critique was held in the Wells Fargo Theatre at the Autry National Center at Griffith Park. The critiques were given by five local Master Artists and were really worthwhile. I learned a lot listening to the critique of others’ work as much as my own. I have to say, it was a little unnerving at first to see my painting projected onto a large theater screen, but thrilling as well. 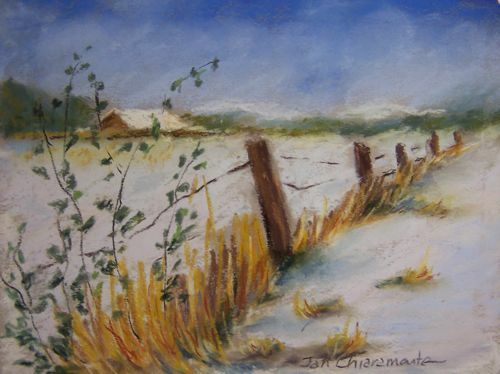 I received some very nice comments on my pastel (show above) called Utah Snow along with some good advice. The only complaint I had was that 90% of the work submitted was oil and maybe 9% watercolor…..I believe there may have been one or two other pastels, and I really wasn’t able to determine whether all of the critique group recognized it as pastel and not oil (sometimes it isn’t easy to see if you are only looking at a photograph). A good friend and former co-worker, Elaine Maslen, joined me and mentally held my hand during the process! It ended up being very enjoyable, as was the lunch afterwards. I’m always nervous the first time I do things and I know that the next time will be so much easier. Thanks, Elaine, for your support! I hope you will feel comfortable adding your comments to the blog, rather than email as we have been doing. I know we have been doing that for quite awhile, and I’d never turn a good word down :-), but I’d like to move all the work and comments onto this site if I can. Thanks for looking and all your support!!! This entry was posted on Sunday, July 26th, 2009 at 3:48 pm	and is filed under Architecture, Color, Flora, Landscapes, Miscellaneous, Paintings, Pastels. You can follow any responses to this entry through the RSS 2.0 feed. You can leave a response, or trackback from your own site.